It’s not very often that a Long Distance Rider gets an opportunity to ride an extreme ride on someone else’s bike with some financial support. So when CFMoto offered two of their 650TK’s to Karl Pirchmoser (Skidoooo) and I to test out we jumped at the chance. The ride chosen for the test was one of the most difficult LD Rides in Australia, the Trans Australia Insanity. 10,200kms from Byron Bay NSW to Denham WA and back in 6 days. This ride has only been successfully completed once before on a GTR1400 by LD Riding legend “Davo” Jones. CFMoto clearly had a lot of confidence in their lightweight LAMS tourer and were ready to back their product. Frankly the LD Community and yours truly did not share that level of confidence in the newish brand. But that only added fuel to the challenge level for Karl and I. The ride was to be done with no support other than a third rider Lionel Haynes who volunteered to join us, riding his own bike, to take photos. The CFMotos 650TK’s were to complete the task on their own merits or not, whatever the case may be. 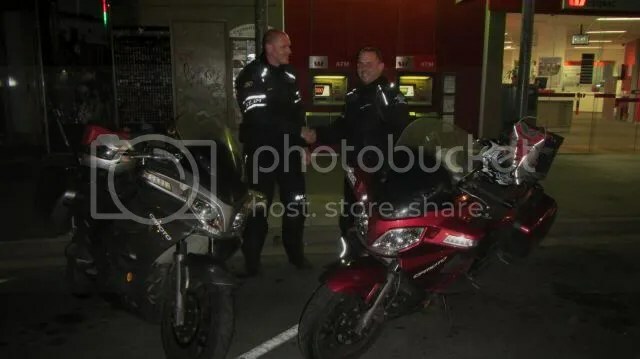 We left Byron Bay shortly after 4am on day 1, mild temperatures and winding roads through Casino to Tenterfield quickly revealed one shortcoming of the bike. The lights aren’t great, particularly when cornering right. This was probably exacerbated by the fact that we are well used to substantial auxiliary lighting that did not form part of the bike setup for this trip. However this section also highlighted one of the things I really like about the bike, riding it around corners. Even loaded up with luggage and 10 litres of extra fuel the bike was tight and willing to be pushed in the twisties. We made it to the edges of the tyres without dragging the footpegs. We rode past Armidale, Gilgandra, a quick stop for a pic at Cobar then out into goat and emu country heading towards Broken Hill. Along here the the temperatures began to soar into the 40’s. The sun started to set but the dark did not bring lower temperatures. After a quick break at Yunta Karl was unfortunate enough to strike a kangaroo head on. We checked right over the bike convinced that there’d be substantial damage but despite a plethora of “fluff and bits” on the forks and plastic the tough 650TK was completely unscathed and we were collectively impressed. We ended the day in Port Augusta, sweating but feeling good. The bikes were comfortable enough even for my 195cm frame. It was a tight squeeze however and the addition of an Airhawk gave my shins a touch more clearance from the fairing. Strangely there is a 12volt power outlet on the fairing facing your left leg. There’s insufficient room there to plug anything into it without interfering with your legs. The suspension is a little harsh when the bike is not loaded but with full panniers and some additional fuel it soaked up the bumps and undulations and I only bottomed it out once in the whole trip. Following Karl through bends and over undulations there were very few signs of the bike wallowing around under the load. In terms of luggage, the fixed panniers accommodate the same amount of luggage I put in my ST1300, I even used my ST1300 liners. Here’s Lionel and Karl ready to ride after a good sleep. and a pic of the Galah just a couple of hundred metres up the road. Then after Ceduna it was the Nullabor Plain and a quick stop at Border Village and the border of SA and WA. And another at the start of the 90 Mile Straight. Then we rode on to Norseman finishing in Coolgardie brought milder temperatures. The strong hot winds usually experienced across here at the time of year were thankfully cooler and coming from the sea. We really settled into the bike on this say, munching kilometers at 110kph with ease, overtaking road trains without the need to change down and enjoying the sweet spot in the rev range of the bike. There’s no cruise control on the 650TK but the handgrips are wide and I fitted an Omni-Cruise which worked really well when the right hand needed a rest. A great day for a ride! It gets a bit bright out there though. Day 3 consisted of backroads heading north east in Western Australia to Moora where we stopped at the bakery for a nice lunch. While we were there Karl made some calls to organise the fitting of some new rear tyres at Geraldton on the way through. 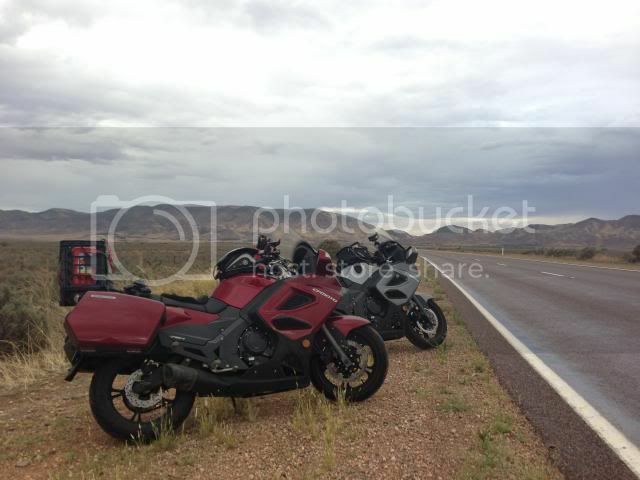 The OEM tyres on the bikes were not really suitable to the more extreme version of touring we were undertaking. CFMoto were more than happy to assist with that. After the tyre stop we continued north turning at the Overlander Roadhouse to the Shark Bay Heritage area where Denham and Monkey Mia are found. We arrived just on sunset, took a few pics and bedded down early getting ready to start the trip back. Sadly there was no time on this trip to look at the Dolphins. We left Denham at 1am local time and the warnings from the locals about the ‘roos in the area were spot on. They clearly don’t see much traffic at night here and we rode into about 140ks of red jumping chaos requiring much care and lower speeds. That improved as we headed south to retrace our route arriving in Geraldton close to sunup. At Moora we decided to take a different route through to Northam and have a bit of fun. The fun was to choose to ignore a GPS direction and see how we went. Lionel took a different route to us and the LD Riding Community that were watching our SPOT tracks were apparently having some difficulty understanding what was going on. We collectively enjoyed the knowledge that they would be. The detour however provided us the opportunity to ride some amazing, winding backroads that proliferate in that area and again test out the handling of the TK’s which went like a dream. We arrived at Northam smiling ear to ear. And we couldn’t resist taking a pic of the Ettamogah Pub at Cunnerdin WA. Back on track heading east through Southern Cross and Norseman. The sun went down and we finished the night riding the 90 Mile Straight in the dark and Caiguna was our stop for the night. Once again we left in the dark, rode back across the WA/SA border and took some time to enjoy the views of the Great Australian Bight. and back onto the Nullarbor Plain proper. By this time we’d become very familiar with the fuel range of the 650TK in lots of conditions. The specs suggest 17.5litres capacity in the tank, and it may well be, but filling the bike on the rather short side stand will reduce that to around 15 litres from empty. However you can expect 300kms from a tank and up to 350kms or so if you aren’t pushing hard or riding into the wind. We used our 10 litre jerrys often to save the time of getting receipts etc so we were operating on around 500kms. 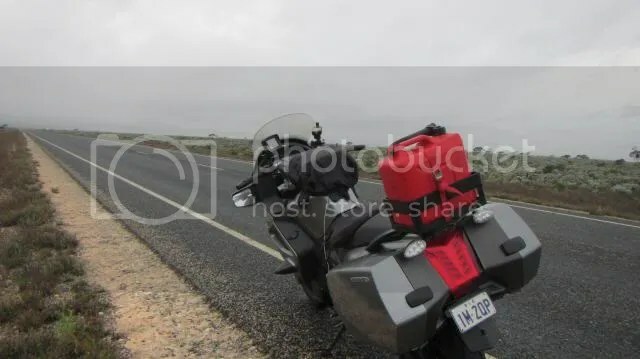 Between Ceduna and Port Augusta heavy showers replaced the ever present dust and wind of the previous days and we enjoyed getting damp, not bothering to close jacket vents or putting liners in. The protection provided by the fixed screen and fairing from the elements is more than adequate. The screen delivered clean air to my chest and shoulders leaving my helmet without buffeting (remember I’m very tall) . In terms of comfort the only thing I noticed was heat coming up from the engine between the tank and seat which became uncomfortable when the temperature of the day was really hot. This is not the only bike I’ve ridden with this issue. We caught sight of the hills south of Horrocks Pass just before sunset. and then rode through Peterborough, Yunta to Broken Hill in the dark. Fortunately the roos were well behaved this time. Unloading the panniers that night revealed that the rain, like the dust had not found it’s way into the panniers, which was great news. We left Broken Hill about 6am on the last day and at Cobar Karl and I received the news that Lionel had bought some bad fuel in Wilcannia and could not continue. We had plenty of time to finish the ride but decided to remain efficient and get it done. Soon we would be out or road train territory. The ride back to Byron Bay was uneventful but it is worth noting that another LD Rider came out to meet us and provided us some glorious lighting to follow back in the twisties around Casino and an express run back into Byron Bay shortly after 10pm giving us a 6 hour margin. Onya Crappy! We’d done it with 6 hours to spare! This ride was fully documented to IBA standards. Independent witness statements were obtained, at the start, in Denham and at the end. All fuel receipts were kept with a detailed ride log and satellite tracking. The documentation was submitted to the IBA and the ride has been verified and certified.